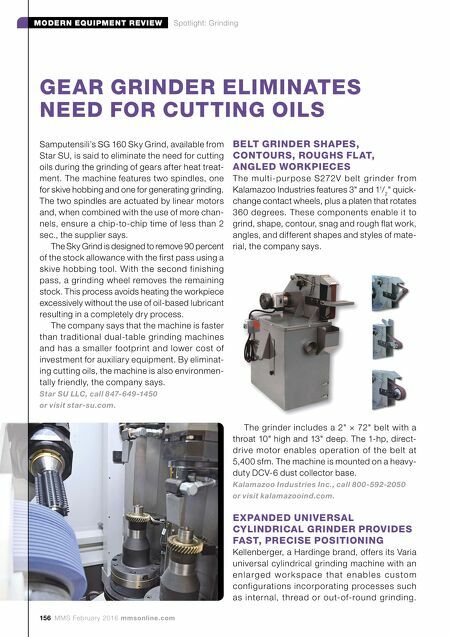 156 MMS February 2016 mmsonline.com MODERN EQUIPMENT REVIEW Spotlight: Grinding Samputensili's SG 160 Sky Grind, available from Star SU, is said to eliminate the need for cutting oils during the grinding of gears after heat treat- ment. The machine features two spindles, one for skive hobbing and one for generating grinding. The two spindles are actuated by linear motors and, when combined with the use of more chan- nels, ensure a chip-to-chip time of less than 2 sec., the supplier says. The Sky Grind is designed to remove 90 percent of the stock allowance with the first pass using a skive hobbing tool. With the second finishing pass, a grinding wheel removes the remaining stock. This process avoids heating the workpiece excessively without the use of oil-based lubricant resulting in a completely dry process. The company says that the machine is faster than traditional dual-table grinding machines and has a smaller footprint and lower cost of investment for auxiliary equipment. By eliminat- ing cutting oils, the machine is also environmen- tally friendly, the company says. Star SU LLC, call 847-649-1450 or visit star-su.com. GEAR GRINDER ELIMINATES NEED FOR CUTTING OILS BELT GRINDER SHAPES, CONTOURS, ROUGHS FLAT, ANGLED WORKPIECES T h e m u l ti-pu r p os e S272V b e l t g r ind e r f ro m Kalamazoo Industries features 3" and 1 1 / 2 " quick- change contact wheels, plus a platen that rotates 360 degrees. These components enable it to grind, shape, contour, snag and rough flat work, angles, and different shapes and styles of mate- rial, the company says. The grinder includes a 2" × 72" belt with a throat 10" high and 13" deep. The 1-hp, direct- drive motor enable s operation of the belt at 5,400 sfm. The machine is mounted on a heavy- duty DCV-6 dust collector base. 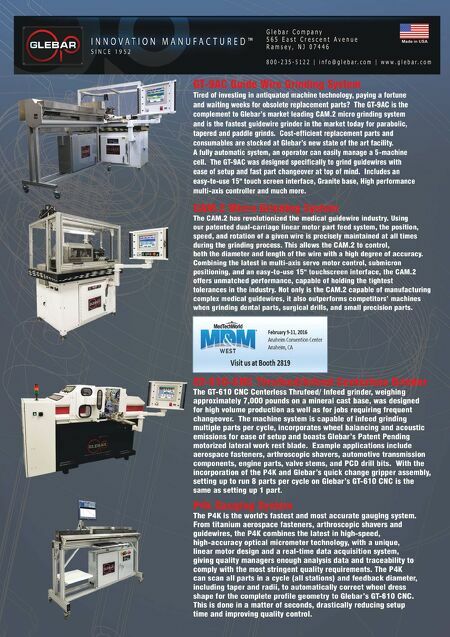 Kalamazoo Industries Inc., call 800-592-2050 or visit kalamazooind.com. EXPANDED UNIVERSAL CYLINDRICAL GRINDER PROVIDES FAST, PRECISE POSITIONING Kellenberger, a Hardinge brand, offers its Varia universal cylindrical grinding machine with an e n l a r g e d w o r k s p a c e t h a t e n a b l e s c u s to m configurations incorporating processes such as internal, thread or out-of-round grinding.